The outline details are that 787 miles (1260km) were covered in 16 engine hours. Day 1 got me to Belfast. Day 2 was R&R. Day 3 onwards was allocated for the west coast, but the wind was gusting 'heavy going' to 'verging on stupid' so I hopped from field to field to an exit back to Wales at Wexford. Allowing for ground time, this works out at under 55mph (88kph). 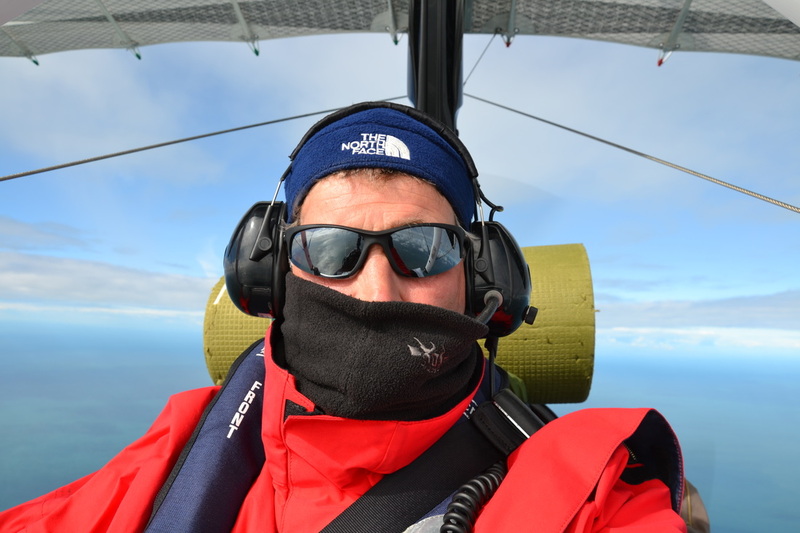 While manageable on the ground, there was a constant and turbulent wind from the west as soon as one got to a 1000ft (300m). The 105miles (170km) from Netwtownards, near Belfast, to Abbeyschule took 2.5hrs, with speed against the headwind falling as one got further west. 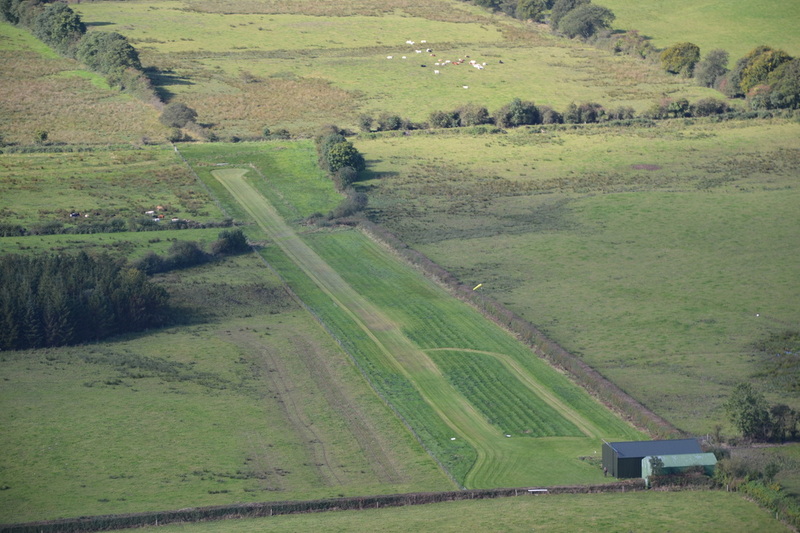 However, 13 flights were achieved and 9 new fields bagged. Hard work, but skills sharpened, technique honed, people met and stories to tell. It took 4 missions to get round Scotland. I fear Ireland will be the same. 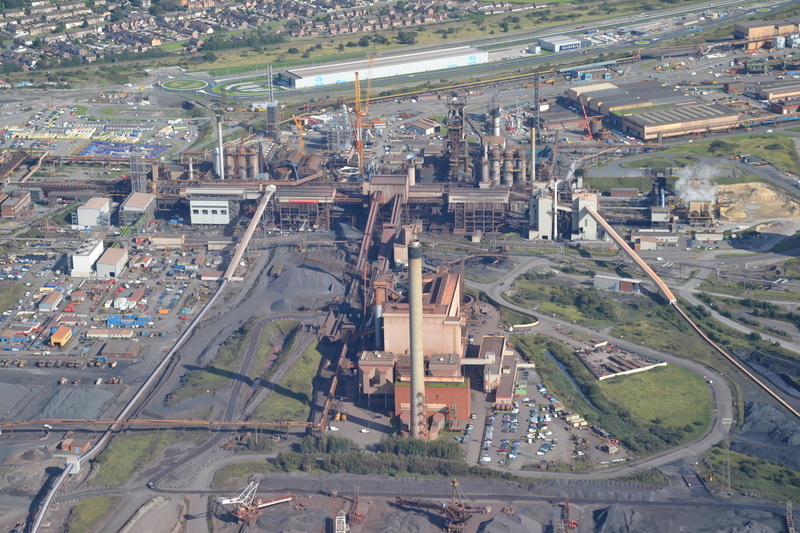 Day 1: 294miles (475km) to Newtownards, via Caernarfon. One of those days when the weather forecast proved to be optimistic. The intention was to depart at 0900. 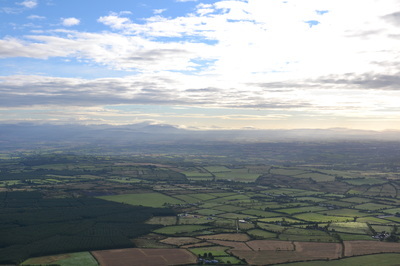 On climbing up through the broken cumulus to 3000ft (900m), the air to the north was solid cloud. I returned to the start. 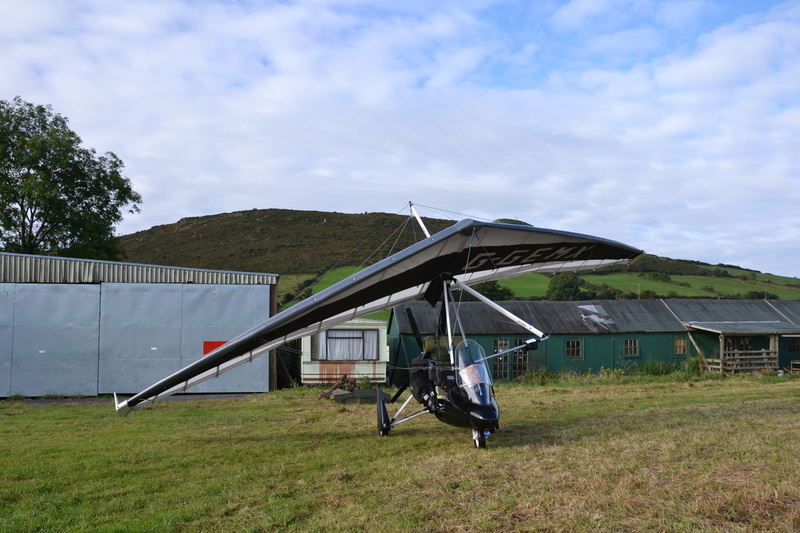 Second attempt was at 1200, with the options of either going over the Bristol Channel and through the Brecon Beacons, or inland up the Welsh-English Border. 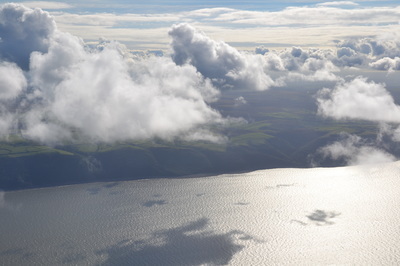 Once airborne and with a clear view of the north Devon coast, but not south Wales some 20miles (32km) across the water, the inland option seemed much more attractive. With no significant wind I flew past Bristol and the Severn Bridges and along the eastern edge of the thick skies over the Welsh hills. I eventually chose to turn west along the Usk valley and was able to maintain VFR across the low hills and out to the coast at Aberystwyth. Then it was a nice run up the coast to Caernarfon. 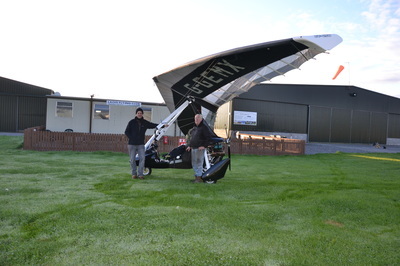 Total flight time of 3hrs for the 180miles (290km). 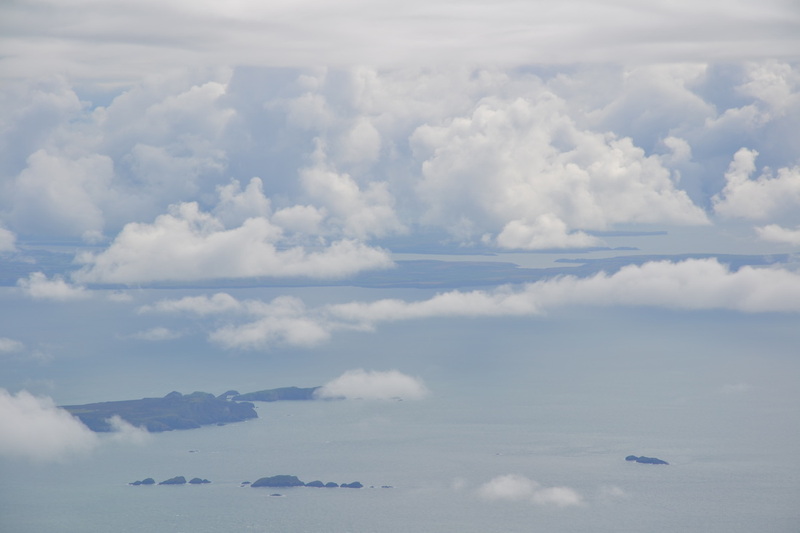 Here in North Wales the cloud base was pretty solid at 2300ft (700m), but with small gaps that allowed strong, angled beams of light to plunge into the sea. Some well defined, but very visible showers moved slowly at a lower level. Once airborne and about to coast out for the 80miles (128km) to Ireland could certainly pick out the Isle of Man and had a sense of Ireland away to the west, Feeling safe and warm in my immersion suit, but not unaware of the empty expanse of sea I had to cross, I aimed for the western tip of the Isle of Man. An artificial comfort perhaps, for it extended the distance, but I was able to establish contact with Ronaldsway. In the silence of the Irish Sea there was at least someone who would hear me scream. 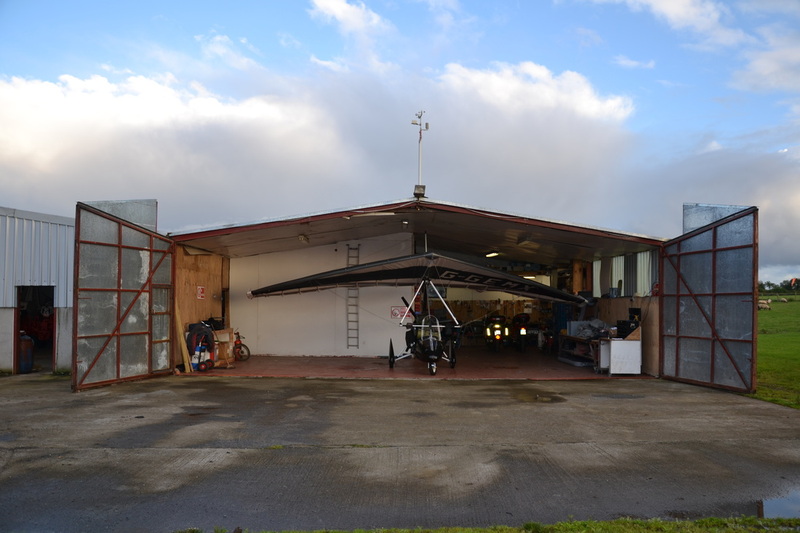 The degree of westerly in my heading, and the wind from the west, caused me to up trim for more speed than I usually do, and I was able to maintain some 60mph (95kph). No one else on the air, and no ships on the sea. The Mountains of Mourne, occasionally bathed in shafts of sunlight, moved in the distance on my left. The Isle of Man assumed greater definition on my right. The mouth of Strangford Lough increased in definition as The Calf of Man faded. Losing Ronaldsway, I changed to Belfast. Nothing heard, but houses were now discernible on the coast. Then the relief of having solid ground under the wing. 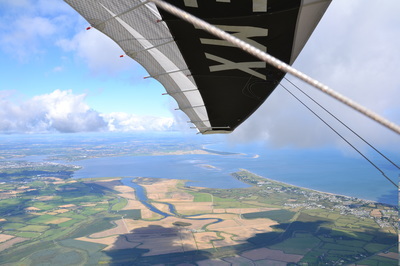 I flew up Strangford Lough, hearing several planes incoming from the south, and landed after 2hours in the air, 1,5hrs of which were over water. 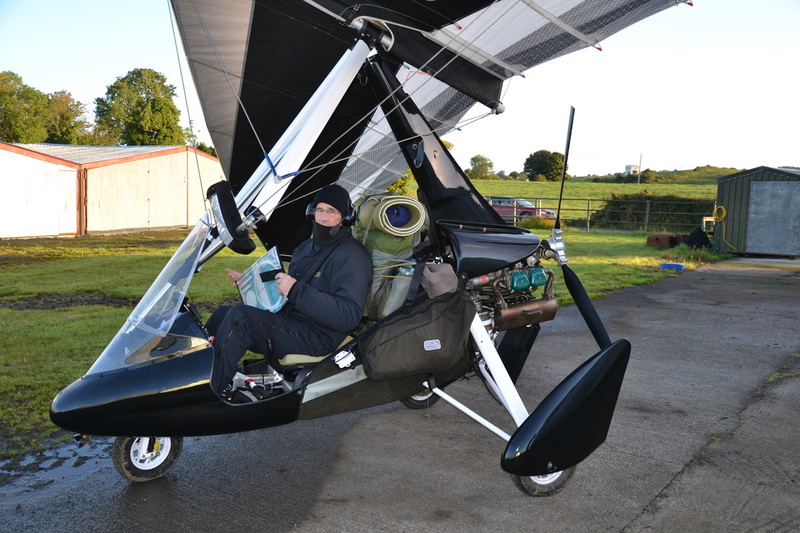 I am a big fan of Ulster Microlight Club in general, and Gerry Snodden (Instructor) in particular. 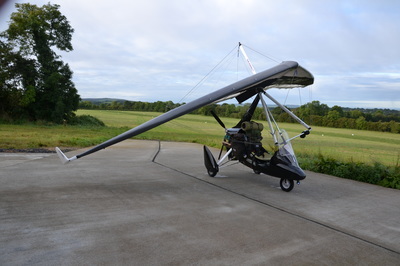 I know he was not worried about my being 15mins behind schedule, but I appreciated his coming up to the field to let me stow the GT450 in the hanger for two nights. He had also called me earlier in the afternoon to voice concerns about the visibility over the Irish Sea. I certainly used his view in my decision to do the final leg. Indeed, it was one of those days when you have a plan, but you know you will have to adjust it. Constant assessment and re-evaluation is the key here. So a tiring 300miles (480km). Not upset that the forecast for the next day was unfavourable. I was able to spend the weekend with friends of long standing (I had acted as their 'best man' 31 years previously) without looking at the sky. Further delay came from a procedural error on my part. My flying pattern, into Europe, had got it into my mind that the General Aviation report (GAR)*Note 1 was only required coming back into UK. 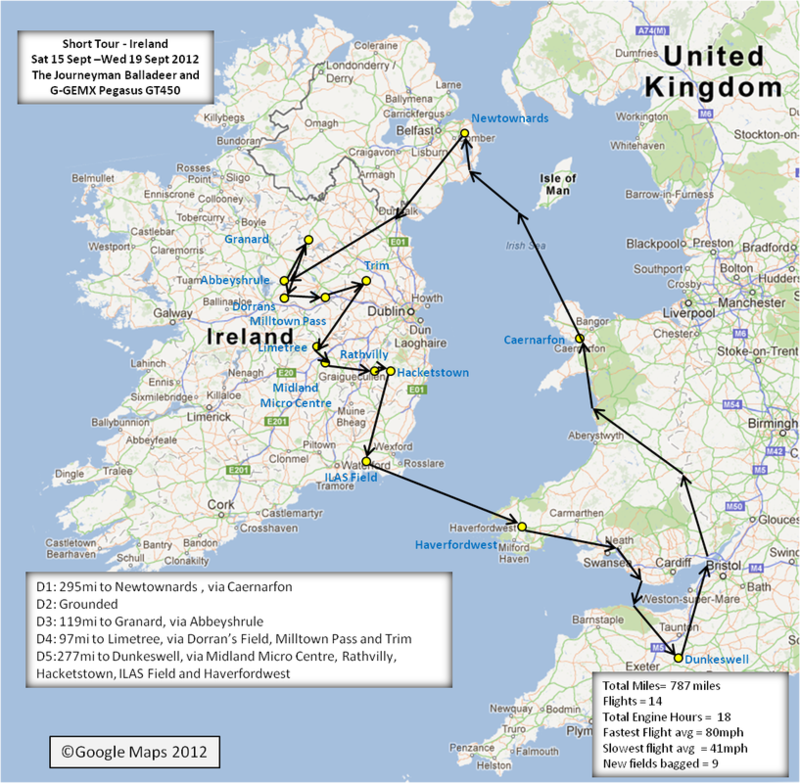 Of course, it is also required to go from the mainland to Netwtownards in the 'province' of Northern Ireland. North of England flyers will, of course, know this. 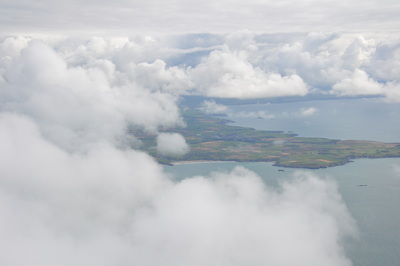 I had called Caernarfon (on the north coast of Wales) to check the weather before departing and had mentioned that I intended to fly on to NI. It came as a surprise (but on reflection not a surprising surprise) when the North Wales Police called my home field of Dunkeswell to say they had no GAR from me for Newtownards. Op. 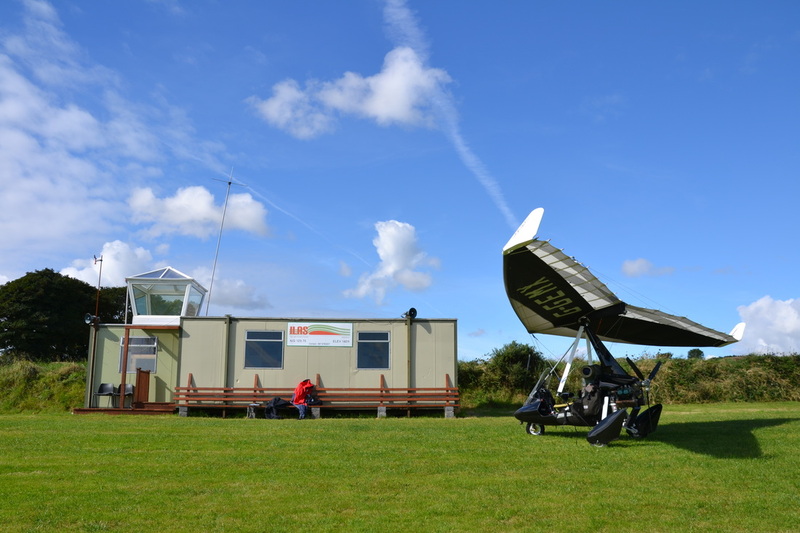 Pegasus, the UK GA initiative whereby the community works with the authorities for border protection, means that an airfield will inform their local police of any known border crossings. Fair enough, and the Welsh officer was sympathetic and flexible. So I did an on-line submission to the URL in my touring notebook. This is, of course, was for my local county, and there is no automatic passing on to the North Wales Constabulary. So when I presented the filling number at Caernarfon I looked a bit of a numpty. Still no valid GAR. However, the sympathy and flexibility (and indeed patience) of the North Wales officer was maintained, and I filed into the right system just before departing. *Note 1: Explanation for non UK readers. 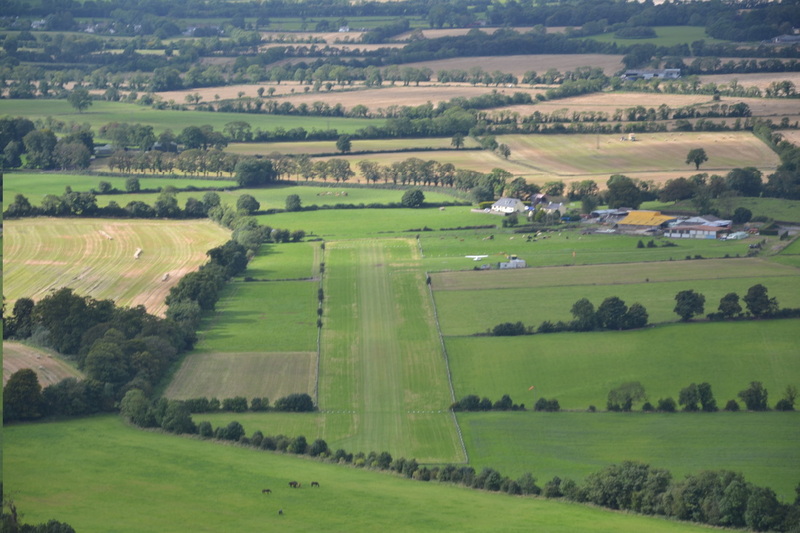 On entering the UK a pilot can land at a designated airfield during operating hours, which deal with the light but important immigration formalities, or at an airfield that has been granted a Certificate of Agreement. In this second case the pilot must submit a completed GAR in advance. For touring purposes it means you need to get to a PC or fax machine 24hours in advance of entering the UK. Day 3: 119 miles (192km) Newtownards to Granard, via Abbeyschule. 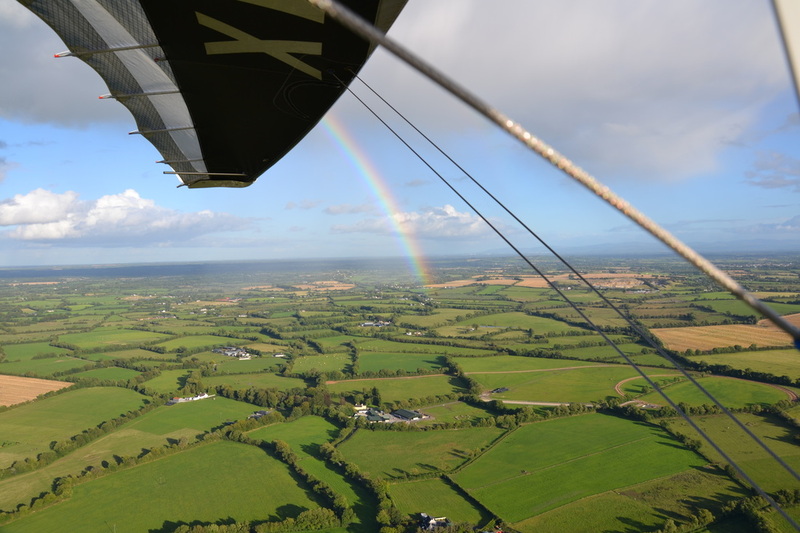 ﻿Early morning admin of packing and checking, paying fees and filing flight plans for the crossing to the Irish Republic meant that I left at 1150. Reasonable day, so courage high and heart aglow. This was bounced and shaken out of me after a slow crawl down to the border at Newry, and then heading south west for Abbeyschule. 2.5hrs at 40mph (65kph), in part due to the headwind and in part dodging rain. No activity on arrival, but a welcome in the GA maintenance facility and an invitation to drop in at Limetree from Ian Brearton. Make a brew and have some lunch. Joined a pilot who was off to the petrol station. Looked at the sky, saw the scudding clouds, and decided that finding a comfy billet for the night was the priority. Arranged to stay at Grannard, which had the double benefit of being close and downwind. 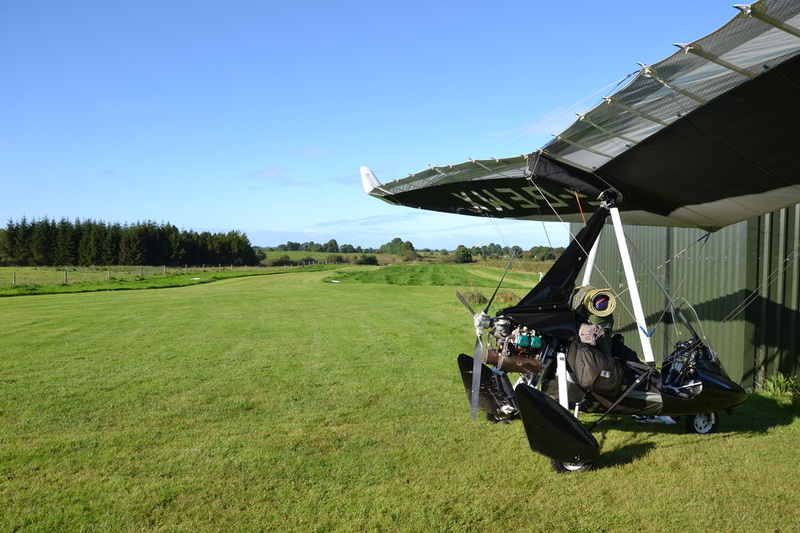 The 13 miles, plus all the taxi, run up, pre-flight etc only used 25 engine minutes. 30mph (48kph) tailwind immediately after take off. Fortunately, and I had checked, the runway was into wind. Funny how that happens. Interesting approach due to the immediate hill, which really does lead to a slow approach with strong uplift. Made very welcome and offered an old caravan for the night. Broke out the Chateau Musar 2001 and one of my best tinned French meals. Very useful to have the light and space to review all options for the morrow. Howling winds forecast along the west coast for days, but decide to feel my way west, with a reserve plan of bagging fields and heading home via an overnight at Limetree. Day 4: 97 miles (156km) Grannard to Limetree via 2 strips. ﻿Ever the optimist, I was away at 0830, and heading for the Atlantic. By 0835, at 1000ft (330m) I was surprised to be not far beyond the Grannard Perimeter fence. The GPS advised that I was peddling into a headwind in excess of 40mph, which had not been evident on the ground. Clearly it would be worse at the coast, which would take not 1hr 15mins, but some 3hrs to reach. I swung back to Grannard to add details to Plan B. My host pointed out a friend's field at Dorrans, only 18 miles off and with the wind up the chuff. Arriving shortly before I took off I was treated to beverage and biscuits by the owner (my apologies for not writing his name in my diary) and saw his Dragonfly in the hanger. No way he would be flying this week. 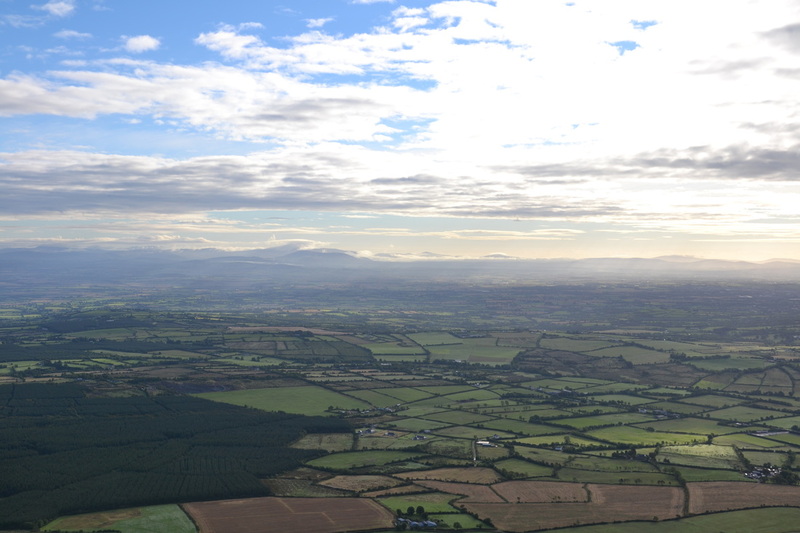 Consulting my latest iPhone app (Kevin Glynn's VFR Flight Guide Ireland), I identified two fields to the east, and notionally easier weather. Ah! 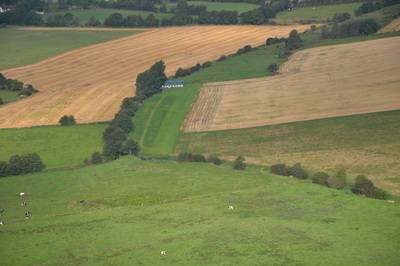 Milltown Pass - if ever there was a field that promised so much and delivered so little. Bogged in twice, and worked up a sweat twice as I hauled the 250kg GT450 to firm ground. Tied it down in as sheltered, and firm, a spot as possible and stood watching the rain clouds beat past. It was the rain that saved me from damage and worse. I was lined up to go when another shower arrived. Switched off and stood under the wing, and was firstly surprised, and then mortified, to see two tie downs draped across the rear axle. Not offering an excuse, but my pre-flight sequence had become rather disjointed. Milltown Pass may, one day, get a terminal, but that day nearly saw a terminal event. 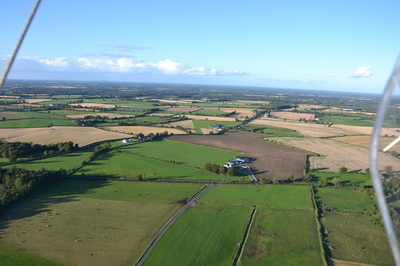 Learn and Live, and on north east to Trim in Co.Meath. 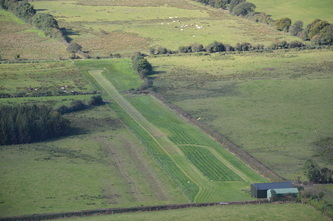 Lovely field - easy to find, wide runway, firm ground, nice club house, fuel available and an interesting host. Pat Murphy, farmer, listened respectfully to my yarns and soi disant heroics before revealing that farming was his family business. He actually was an A321 pilot with Aer Lingus. After a 4 hour visit, which included 40 unplanned winks, I sallied forth for Limehouse (near Portlaoise) in more stable air, evening sun and manageable rain showers. The photo of the rainbow (6th photo above) catches the evening nicely. The reception at Limehouse was equally pleasant. Drank some beer, did some maintenance, filed my GAR for the return the next day and had a long sleep. Day 5: 277 miles (445km) Limehouse to Dunkeswell, via 4 fields. Waking early, I did a quick dawn patrol to enjoy the noticeably cooler morning and to check out the work done the previous evening. The plan was to make best use of the day; cross the Irish Sea by mid-day, bag a few fields, and get into Dunkeswell with a good few hours of daylight in hand. Things went well from the start, with a easily handled but helpful wind that started on my starboard quarter and then settled out of the west to give a tailwind of 25mph (40kph) over the water. Quick stops, unannounced I'm afraid, at Midland Micro Centre, Rathvilly and Hackettstown. No harm done, since all were deserted. 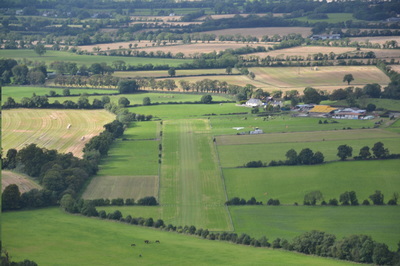 Into the more established and sheltered ILAS (Irish Light Aircraft Society) Field, at Wellington Bridge near Waterford, this time with permission previously requested. Did my pre-water meditation and unwind, donned the figure hugging immersion suit, and then launched into the big blue yonder. Wonderful flight at 6000ft (c 1800m) with good comms with the ATC right from the taxi, and my transponder signal standing out big and bold on their screen . All this makes for a more reassured frame of mind, this time enhanced by doing the 60 miles (of which 50 were water) to Haverfordwest within the hour. 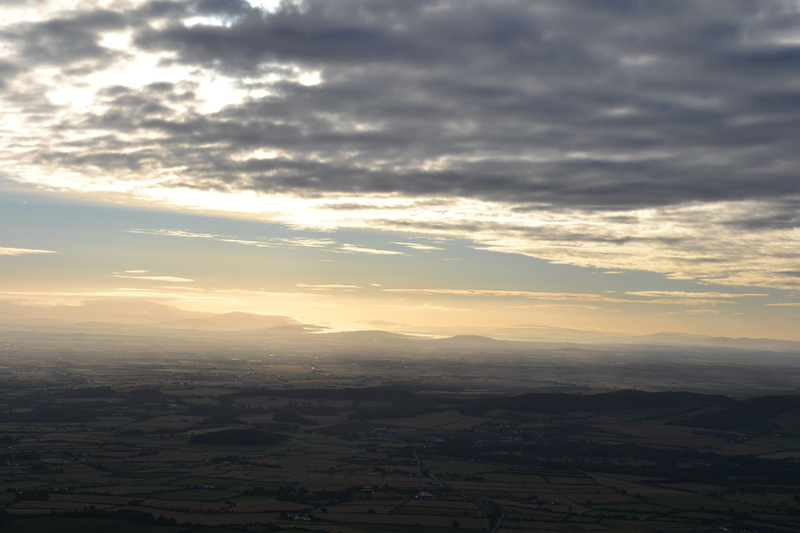 Wales appeared, marked by clouds, just as Ireland faded. Formalities completed, tanks topped, it was a thing of joy to do the 113 miles (181km) to the Home of the Brave in 90 minutes. So a great finish to offset the two previous days of making the best of it. 787 miles (1,266km) in four flying days, 9 new fields logged and some £240 (340 Euro) spent on fuel plus three landing fees. Ignoring depreciation and ownership costs that's £75 (106 Euro) per day of liberating entertainment. Can't do that in a Cessna! Faugh a Ballagh*. *Faugh a Ballagh is Irish for Fear Naught. It is the motto of the Royal Irish Rangers. The friend I went to visit was a former Commanding Officer of one of the R.Irish Battalions. Fear Naught is the motto of my own regiment, The Royal Tank Regiment. By these things are we connected.